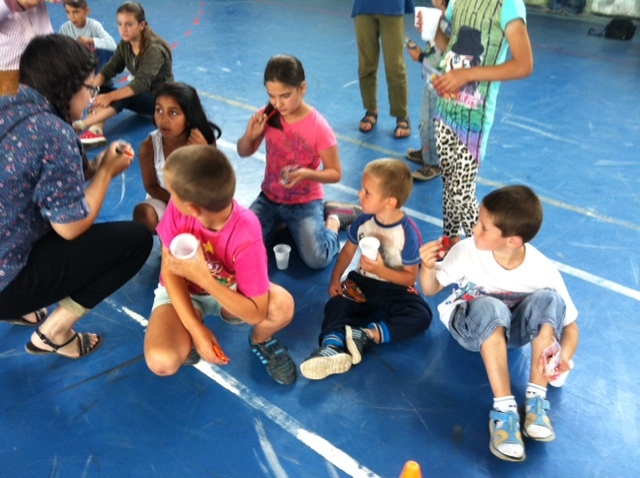 Nearly 40 children ages (approximately) 4-12 and a half dozen mothers gathered in the gymnasium of a small Romanian village on Monday morning. They waited for our team with a mix of excitement and curiosity. Who are these foreigners, and why are they coming here? One of the four career missionaries with whom we’ve partnered grew up in a nearby village. Her mom and brother still live there, and she and her husband return to the family home often. Because of her connection there, this ministry began serving the region’s poor by distributing Christmas hampers many years ago. 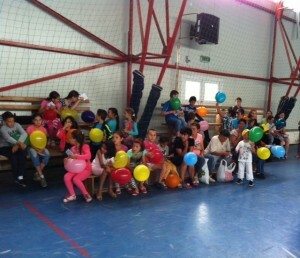 Now, the school’s director had invited them to bring a team to come and provide a special day for children. We broke the ice by singing a couple of silly camp songs and inviting them to participate by doing the actions with us. If anyone had suspicions or doubts about us, they vanished as we acted like goofballs together and laughed until our sides nearly split. 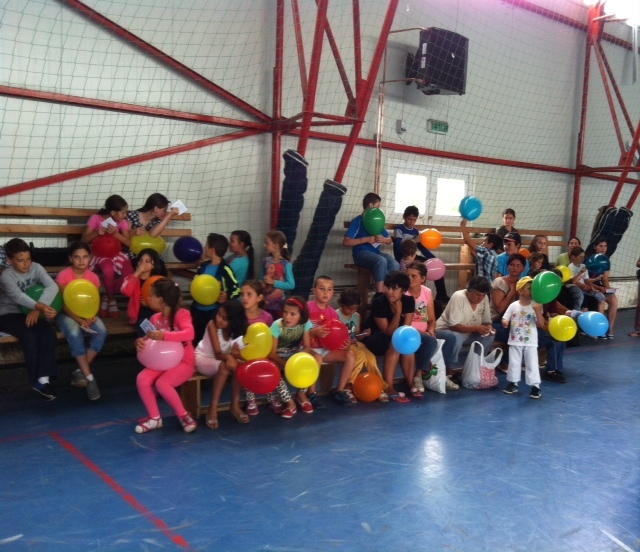 Relay races, bracelet making, balloon games, a soccer game, and a simple Gospel presentation followed. Then everyone received a Gospel tract, a pencil, an inflated balloon, and last but especially not least—a pizza and soft drink as a special treat to take home. These simple gifts might not sound like much, but they’re a simple token of hope to a community in despair. As though chronic poverty was not enough, the region suffered a horrific hailstorm and flooding a couple of weeks ago. The hail damaged buildings’ exteriors, broke roofs, and shattered windows. The storm felled trees and wiped out corn crops. These crops—used to feed pigs and chickens—means the animals will not survive. Subsequently the people will not have meat to eat this winter. Flooding contaminated the drinking water, and illness is the natural fallout. Medical care is practically non-existent—only the emergency room remains open in the only hospital for the entire area, and necessary medical supplies simply are not available. A personal highlight was tossing an inflated balloon back and forth with a little girl who was scared to play “Duck-Duck-Goose.” She’d run to her mother and hid her face in her lap, so I blew up a balloon and gave it to her. A smile lit up her face, and she eagerly accepted my offer to play with her for a few minutes. Our prayer is that this outreach will have opened the door for future opportunities. The town’s mayor had coffee with us upon our arrival in the village, and he’s expressed his desire for partnership so his community can receive the help they so desperately need. We look forward to seeing what God will do. As you read this, my husband and I are traveling by train to Krakow, Poland. I’ll post pics as I’m able over the next few days. On the 23rd we’ll fly to Berlin to meet our next missions team, and then we’ll head back into Poland to host an evangelistic family camp. 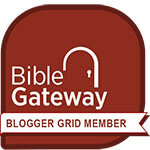 Thanks for prayers regarding physical strength and safety in travels. God is answering.